Back in June of last year, Vince Gilligan, creator of Breaking Bad, caused an explosion of anxiety for fans of his incredible masterpiece. He’d promised them more, more stories written in the universe that they had come to crave, and more Saul Goodman to help them nurse their withdrawal symptoms from a show that many consider to be the finest that they have ever watched. He accomplished this feat by an admission of his own perceived mistake. This simple sentence hit news outlets everywhere. A spinoff of Breaking Bad, featuring one of it’s most popular characters as the focus, and the creator himself was concerned that it wouldn’t live up to it’s illustrious source material? More than that, that it might even shame it. It was these words that sparked a little fear in the hearts of all Breaking Bad fans. That was a long time ago now. But when the series first hit, on both AMC, and Netflix, those words were resurrected in every viewers brain. There was excitement, joy for more of the intensely excellent television that Vince Gilligan was capable of, but there was apprehension also – what if Vince Gilligan was right? What if this show soured it’s source material? It certainly would not ruin Breaking Bad, but would certainly leave a foul taste in the mouth of someone who wanted to just another taste of Breaking Bad. As it turns out, Vince Gilligan is as modest as he is talented – Better Call Saul, tastefully delivered to those to whom AMC is not an option via the medium of Netflix on a weekly basis, is living up to it’s big brother (BB, get it?). While the first episode could be considered a little lack luster, it set the stage well, and showed a master class of how to end your premiere with suspense and nostalgia all in one, the doubts spawned from a simple remark were diminished significantly. 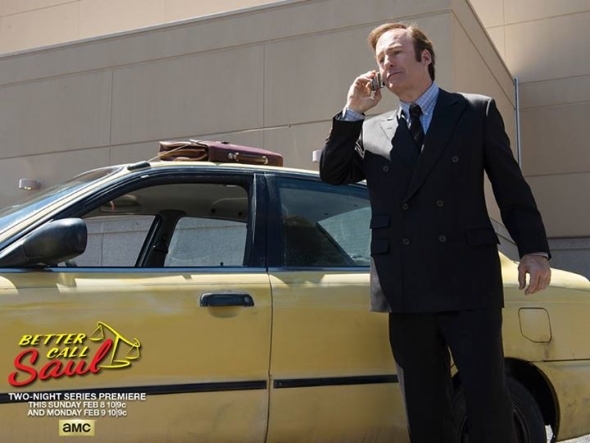 Bob Odenkirk stars in Breaking Bad Spinoff, Better Call Saul. Better Call Saul since that first episode has been getting better and better by the minute. 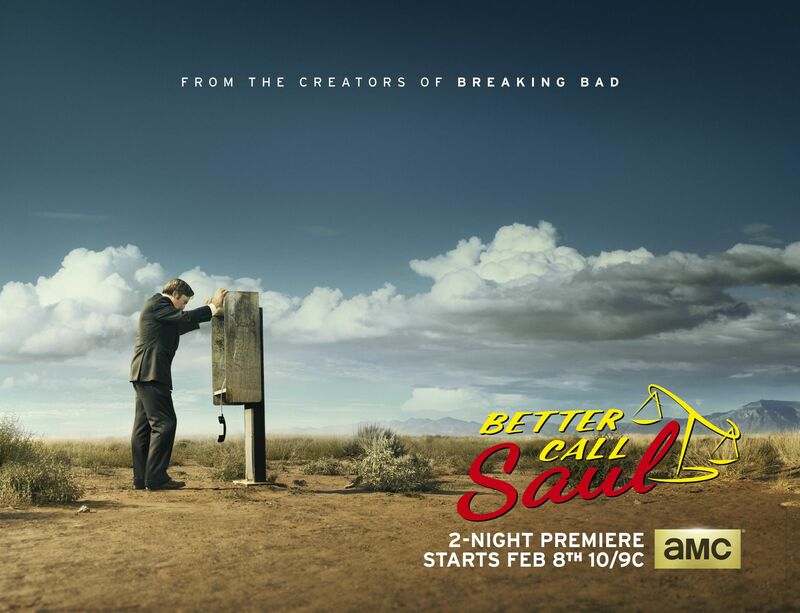 Despite the hindrances of centering your show around a low brow lawyer as opposed to a meth kingpin, in terms of genuine adrenaline fueled excitement, Better Call Saul manages during it’s second episode to get your heart pumping in a way all to familiar to Breaking Bad fans. Another positive one can draw from Better Call Saul is that while there are often nods to it’s source material, it doesn’t rely on these moments. From Jimmy’s (aka, Saul) off the cuff glance at bright and glaring orange shirt typical of Saul Goodman in a suit shop, to Mike simply being Mike, Better Call Saul knows where to draw the line, and keeps the references and nods to a tasteful level, not to much, not to little, just right. It’s able to stand on it’s on two feet, while it tries to fill the big shoes Breaking Bad has left it. In it’s latest episode, at the time of writing, Five-O, Better Call Saul really starts to give us a glimpse of it’s true potential, In an odd manner, as the shows namesake is only briefly involved in the narrative. What it does is display the same intensity, intelligence, and the moral dilemma’s that Vince Gilligan is undeniably talented at producing. The episode centers around Mike, with scenes from both past and present featuring. 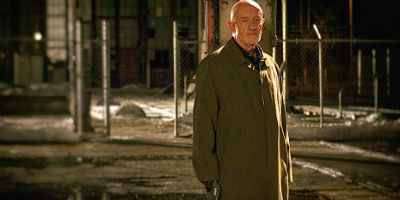 Jonathan Banks (Mike) begins the episode as you would expect, steely faced, largely emotionless, and generally in the same Mike like manner we have all come to enjoy. He remains this way a great deal of the episode, with occasional bursts of the one real emotion that Mike has been known to show, anger, making regular appearances. Without ruining to much of the episodes plot, Mike deals with two men, who had done him a personal wrong, in a way reminiscent of Breaking Bad. Mike during this weeks episode of Better Call Saul, Five-O. But the element of this episode that really makes it great, that brings it to a level equal, and in some ways, greater than Breaking Bad, bares no resemblance to it whatsoever – Mike goes to see his sons widow, who believes that his son was a dirty cop. So Mike tells her a story. Probably the longest monologue that Mike has ever given, but it’s Banks’ delivery that makes it a truly wonderful, exquisite, and emotional sequence. Mikes voice begins to crack, and you can visibly see him hold back tears, in a masterful show of raw emotion, that Mike has likely never shown to anyone in his entire life. It is this, that truly distinguishes Better Call Saul as the complete reverse of a mistake – Breaking Bad was a show filled with strong, rich characters, and a staggeringly crafted narrative, Better Call Saul has taken those characters, and wrung them to the emotional core, and is developing them further than Breaking Bad ever could, shackled as it was by the events that unfolded in the wake of Walter White. Better Call Saul is about the characters, so we can expect more of this excellent development, and with Vince Gilligan at the helm, it can reflect all of Breaking Bad’s excellent qualities, while bringing these new ones to the table.